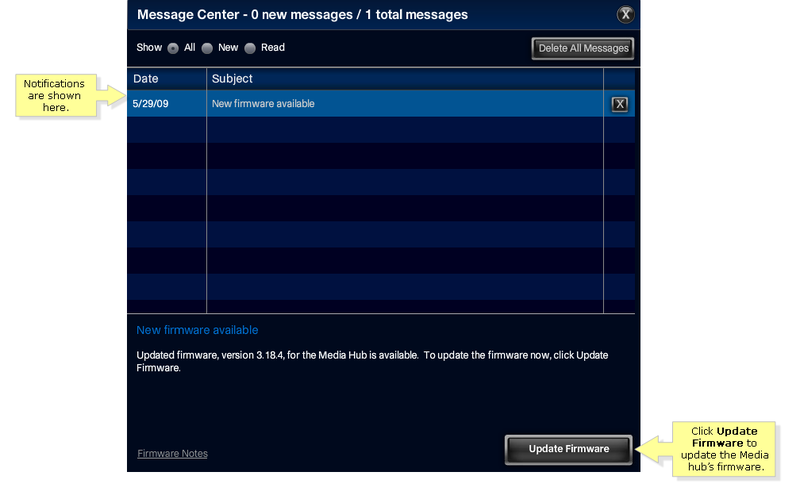 Linksys Official Support - Updating Firmware in the Network Media Hub How do I update my firmware for the NMH and what notifications do I get from the Message Center? The Message Center is a feature in the Network Media Hub that provides notifications on the latest firmware, a drive that is full or RAID degradation. This feature is only available when there new notifications. NOTE: If there are no new notifications, the icon on the upper-right of the screen reverts back to . NOTE: If you are using MAC to access the NMH Series, click here. Click on the Message Center icon and select Messages. The notifications will be shown as below. You have a choice to update your firmware by clicking on Update Firmware. NOTE: The Update Firmware button will only be available when there is a notification for firmware update. NOTE: While updating the firmware, the system will be unavailable and will restart when the firmware upgrade process is completed. The screen below will appear indicating that the firmware upgrade has completed successfully and that the device will now restart.